I had the time of my life on the vacation of my dreams. I was fortunate to be able to knock one item off of my ever-growing bucket list: a trip to the island of Maui in Hawaii. During my trip, I stayed at a beautiful resort amongst some of the top hotels in Maui. The sights and sounds were as if I was temporarily living in a fantasy. Hawaii is known for their beautiful beaches and tropical shores, but it is also a mecca for delicious tropical dishes. 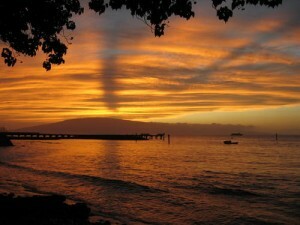 While staying in Maui, I made reservations at the Lahaina Grill Restaurant. 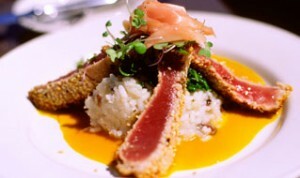 When my plate arrived, the entrée that I selected, the onion-seared ahi, was to die for! The dish was so good that I just had to try making it for myself at home. If the pleasure experienced by my taste buds was any indication, I knew that this would be one dish that would definitely impress my friends back home on the east coast. Caramelize the sliced onions by cooking them over medium high heat in 2 tbsp. of olive oil. Stir constantly until they are cooked and then set them aside. Next, heat 1 tbsp. of olive oil in a pan and then roll the ahi steak in the crushed onions and sesame seeds. Sear until brown on all sides, preferably rare to medium rare. Add the rice to the vanilla bean, shallots, butter, and clam broth. Cook over medium heat, bringing to a boil. Once it is boiling, reduce heat and cover, simmering until the liquid is absorbed. Remove from heat and fluff. Mix the vinegar and cider in a sauce pan over medium heat, reducing to 1/2 cup. Add cold butter and margarine in small amounts while stirring over medium heat. Place in a blender and pulse for a few seconds and then season to taste. On a large plate, arrange the vanilla jasmine rice in the center and top with ahi and a tablespoon of caramelized onions. After drizzling sauce over and around the fish, garnish it with some chopped chives. Serve with fresh seasonal vegetables, preferably organic baby carrots and roasted baby beets.